Summary: Kageyama Shigeo, "Mob," is a boy who has trouble expressing himself, but who happens to be an extremely powerful Esper. Mob is determined to live a normal life and keeps his ESP suppressed, but when his emotions surge to a level of 100%, something terrible happens to him! As he's surrounded by false Espers, evil spirits, and mysterious organizations, what will Mob think? What choices will he make? First Impression: Waaay over the top. I immensely enjoyed One Punch Man, but I didn't really get into this first episode as much as I did One Punch's first episode. My Opinion: As much as I lack the enthusiasm One Punch inspired, I do think this show will be quite amusing. Watching Arataka try to lie his way through an entire series should always be novel. 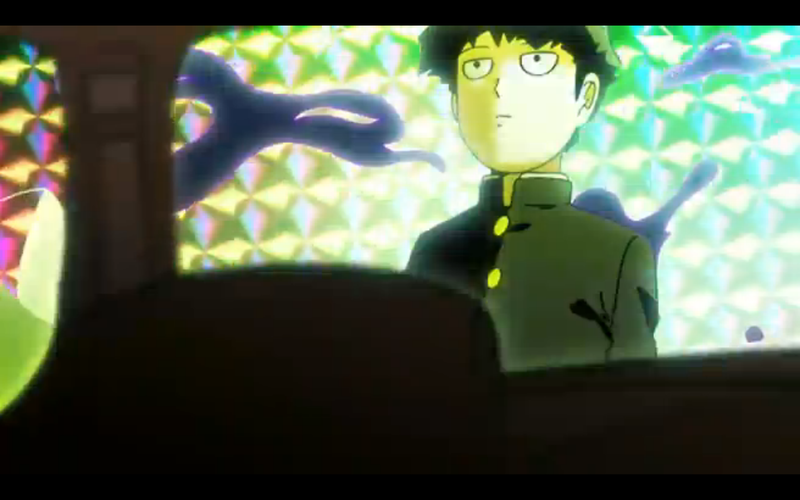 It's just...I don't really like Mob's powers. With Saitama, the fight itself, even if it was going to end the same way every time, with one punch, was always fun to see. The enemies always put a lot of effort in, and that was fun to watch. Every time Mob solves a problem though, visually it's about the same as if he snapped his fingers while some firecrackers went off. Colorful? Yes. Amusing? Not quite so much. But hey, it is just the first episode, and that Percentage Counter slowly ticking up is definitely interesting.